Two hours outside of Cancun, we turned off the main highway and into the small town of Piste. And at this point, our road trip officially began. The goal was to spend two days driving around the Mexican state of Yucatan, a state that offers a major change from life in the state of Quintana Roo, the state where Cancun, Playa del Carmen and Tulum dominate the entire tourism industry of Mexico. Yucatan, on the other hand, is no tourist mecca, apart from the Mayan pyramid of Chichen-Itza which receives daily busloads of day trippers from the more touristy areas near Cancun. Remove Chichen-Itza and you have a large region that provides a most unique insight into Mexican culture and more specifically, into modern day Mayan culture. Perhaps you’re thinking, “Mayans? I thought they were only an ancient civilization?”. I once thought that as well, right until I arrived to Mexico last year and began seeing signs in the Mayan language, a language that has no resemblance at all to Spanish and is still widely spoken in these parts. The Mayans have been around for a long time, more than 4000 years in fact, and yes, they are still around, with many of their communities being located in the state of Yucatan. Starting in Piste, we rolled along the narrow, quiet roads that led us straight through the dense jungle of the Yucatan. And as if my mood hadn’t been lifted enough by the scenery, thousands and thousands of beautiful yellow butterflies suddenly filled the air around us, as if they were welcoming us into the heart of Mayan country. For over an hour we drove through the butterfly-filled jungle and my mouth and eyes remained wide open in awe the entire time. 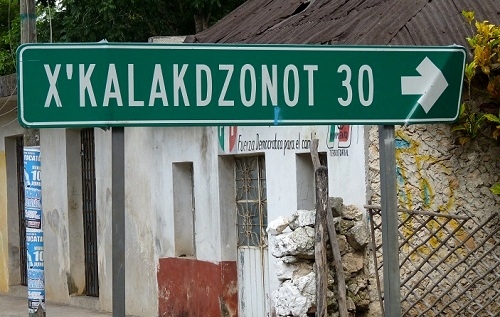 Every now and then we would reach a Mayan village, evident by the village names that were difficult to pronounce and which one would never expect to find in Spanish-speaking Mexico. 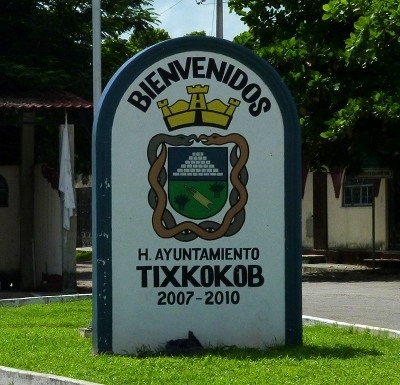 We passed through such communities as Xanaba, Citilcum, Tixpehual, Yokdzonot and Tixkokob, and each village offered another glimpse into Mexico that simply is not possible while living in or visiting the usual vacation hotspot that is the Riviera Maya. 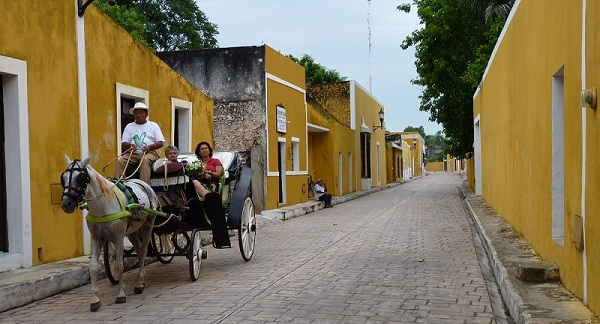 In the late afternoon of that first day in Yucatan, we found ourselves entering the 15,000-person town of Izamal. This town is designated a “Pueblo Magico” (Magic Town) by Mexico’s government, a designation given to towns that offer visitors a ‘magical’ experience due to their unique cultural, historical or natural significance. And if there’s one thing you can say about Izamal, it’s this: It is yellow. I’m not talking about the flowers or the butterflies or even the signs in the streets. I’m talking about every single building being the exact same shade of yellow. The result is one impressive looking town, which is why, moments after our arrival in the town center, we couldn’t wait to begin wandering around. Everywhere I looked I saw yellow and it literally made me giddy with delight. Every time I looked down another street, it naturally turned out to be just as yellow, if not more yellow, than the previous street, and as a result, I felt the need to yell out, “That street is yellow!” every single time (much to the annoyance of everyone around me of course). We wandered across the soothingly peaceful central plaza, full of street vendors and locals chatting to each other while sitting on wooden benches under the shade of the trees. We visited the Franciscan Convent, built atop the remains of a Mayan pyramid, a convent where Pope John Paul II gave a speech to local indigenous groups back in 1993 and which is, of course, as yellow as all of the other buildings in town. From the convent we roamed further away from the center of town, eventually locating the Kinich Kakmo pyramid, a most impressive Mayan ruin site that almost never gets a mention in any tourism material. Upon our descent from the pyramid, and just as the sun began to set, we unanimously decided to spend the night in Izamal. We quickly booked a room at the simple yet atmospheric San Miguel Arcangel Hotel, located right on the central plaza, with views of the convent and much of the town from our balcony. And once we threw our bags on the beds, we were off again, this time to eat some Yucatecan cuisine at a local restaurant (where we ended up watching an intense ping-pong game that was taking place inside of a 24-hour coffin shop across the street). Then, with stomachs full, we took a seat on a bench and enjoyed a lengthy rest while observing the mellow activity of a Saturday night in Izamal. Families ate and laughed together, children zoomed around on skateboards and bikes, a few elderly men played their guitars under a tree and horse-drawn carriage taxis came and went, bringing people wherever they needed to go. I was a happy man as I sat there on that bench, so much so that I found myself on several occasions imagining what it might be like to live in Izamal for a few months. There is something magical (hence the label by the Mexican government) about such isolated locations, locations where life is simple and what we consider to be important worries and stresses of our normal daily lives no longer exist. Some people may find such a town boring and I can certainly understand that. But for me, I find such a town to be both healthy and intensely appealing. Maybe it was just all that cheerful yellow. On the last day of our road trip we departed Izamal and drove to Merida, the capital city of the state of Yucatan, where we spent half the day wandering around once again, visiting a couple of museums, enjoying the festival in front of the cathedral and eating local food that cannot be found anywhere else in Mexico. But I must admit, despite the striking multi-colored buildings and the energetic and positive atmosphere of Merida, a city of one million people, I spent much of the time thinking about Izamal and the other villages and towns we passed through the day before. And when the time came to leave Merida and begin the long drive back to Playa del Carmen, I did not hesitate for even a moment in choosing the route I would take. There was no way I was going to get on the toll highway and speed straight across the jungle, all the way back to the Caribbean coast. 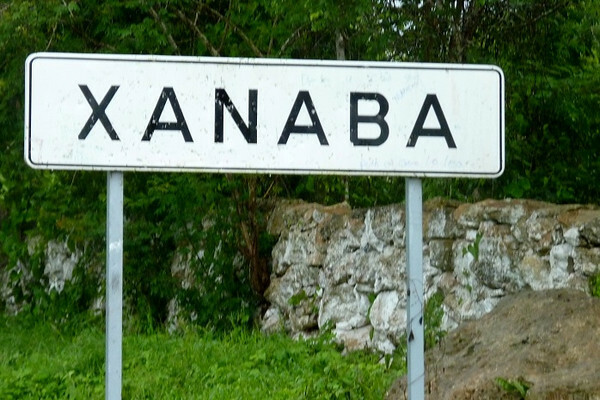 So I turned off the main road and entered the village of Kantunil instead. It would be local roads one more time as I wanted another opportunity to experience the atmosphere of this region. And as we passed through the small Mayan villages of Kaua, Cuncunul and Ik Kil, communities that few travelers reach, I was once again reminded that such a simple, traditional way of life has much to teach those of us who struggle to find peace in the modern world. Have you been to the state of Yucatan? Does it sound like a region you would be interested in visiting? I’ll be busing from Chetumal tp PDC and going to stop in Tulum for a few nights. Can you suggest some nice comfortable budget options. Hey Bridget – That must have been quite a unique experience living in Oxkutzcab! As I was passing through many of the villages in the area I really felt I could spend some significant time there, learning more about the region and the people. Such a different way of life compared to the Caribbean coast. Nice report and pictures. How’s the weather, by the way? Is it similar to Playa’s? P.S. The yellow buildings make me miss my home in Nepal. But it wasn’t this yellow. Hey Jerry – I have not been to Progresso but a few people have recommended that I visit. I’ll get there at some point I’m sure. And as is the case with many towns and cities in Mexico, I have no doubt that Progresso would be an excellent place to retire! are you kidding? we loved it so much we moved here… well, to Merida, not Izamal. But I know what you mean… its beautiful there. The amazing thing about Merida is that it feels a lot more like a small town than a city of a million people… great story, thanks!! I have spent 3.5 hours on this web site and am completely amazed, inspired and in awe with your travels, writing and the great job you have done on the site. I have to go to sleep now one hour later than I should with work tomorrow morning. I have been to Playa Del Carmen once in Nov. 2001 and fell in love with the area. I am planning a trip back to that area again next year, but may not be fond of all the growth that has taken place since I was last there. Hey Mike – The growth here isn’t too bad at all as it really is all concentrated in one area (La Quinta Avenida). As soon as you walk one block away from this street, you’re in a local Mexican town and can easily get away from the tourism. On a side note, I appreciate you having a look and read through my website and sorry about keeping you up a bit later than normal! My heart yearns for this beautiful part of Mexico. I spent three years living in Tulum,Q.Roo and unfortunately I didn’t get to explore enough. However, what I was able to explore and experience had a profound impact on my life. I can’t wait to get back, this time for ever. Viva Mexico! Hey Kris – Well, this is only one of many wonderful places to explore in this region! I’m sure you had some excellent experiences yourself. Great post. I love that area of the Yucatan and all the little villages! Thanks Kay! It’s definitely the perfect area for a road trip every now and then in order to take a break from life near the coast! Hey Karla – It took me some time but eventually I found the right speed so that the butterflies wouldn’t smash against the windshield and would just zoom over the top of the car instead. But I will admit we lost a few butterflies in the beginning. Seems quite unavoidable given how many there are in that area. Great pictures and stories of your adventures. 🙂 It’d be great to swirl around back there and find some of the ruins that aren’t swarming with tourists! 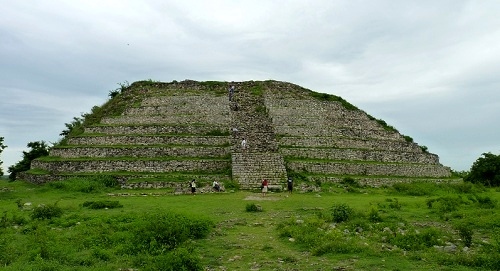 Hey Lindsay – You could spend a month in Yucatan visiting ruins sites that don’t have any other tourists around. They are everywhere but given it’s relative distance and isolation from the more touristy parts of Mexico, nobody passes through! By far Yucatan is my favorite state. This is where the real Mexico can be enjoyed and savoured. Hey Karen – It’s definitely becoming one of my favorites as well! Thats really cool that the Mayans are still alive and well. The mayan words are great looking, like Cyrillic Russian and Hawaiian mushed together somehow lol. How about 2012?? Did you find anything out at the pyramid ? Hey Leif – The Mayan language is fascinating and probably one of the most difficult to put into Latin alphabet form. Every sign left me scratching my head. As for 2012, you really don’t hear too much about it over here. From what I’ve gathered, the Mayans just believe that there will be a major shift brought on by natural disasters although the actual shift they expect seems quite vague. Nobody believes the Earth will completely end. That seems to be the creation of Hollywood! Good to see that Mayan culture is alive and well in Yucatan! 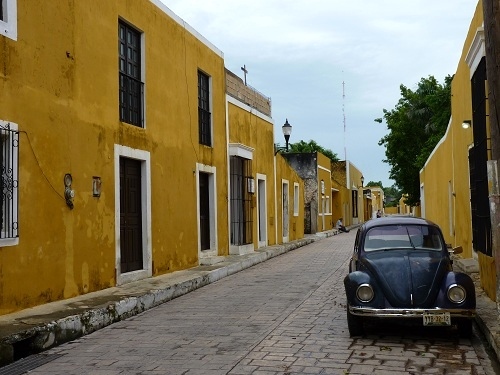 And the lovely yellow of Izamal – reminds me of Chefchaouen in Morocco, “The Blue City”. Hey Dyanne – There is something about a city that consists of only one color. It creates such a unique atmosphere that is hard to ignore. I shall add Chefchaouen to my list of places to visit whenever I finally make it to Morocco! Great road trip story Earl. Your comment about the coffin shop reminded me of walking to Spanish school while in Honduras. I was staying with a family in La Ceiba and their house was right across from the main hospital. I would walk to and from Spanish language school every day, passing many shops that were also located across from the hospital and on a busy road, and it wasn’t until the end of the week I looked in one and realized that it was a coffin shop. Not what I as a Chicago girl was used to seeing. It sure is a different world out there and I love exploring it. I couldn’t help but stare at this coffin shop for around an hour as the ping pong game was so intense. It seemed as if they were having a bet and the loser would have to work the night shift. At least it wasn’t too late in the evening. I’m not sure I would want to pass by or be inside of a coffin shop in the middle of the night. And I guess it’s a good thing you had day classes in Honduras. What great names!!! I love that the city is completely yellow. Reminds of Jaipur with it being the Pink City. Hey Andi – Jaipur is another city that stands out because of it’s unique color. There really was something about all that yellow that put me in a great mood! did you say 24 hour COFFIN shop?! geez! your adventure sounds nice and peaceful. is the food similar to mexican food, or is it rather different, like the language? 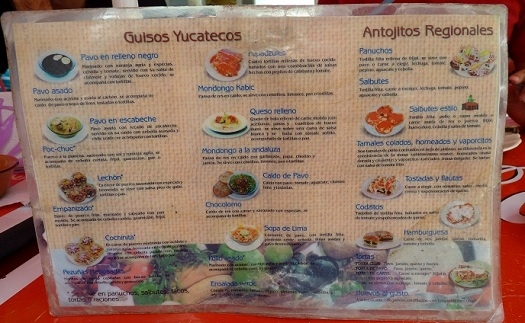 i think i’d relish going to visit yucatan very much. Hola Jasmine – One excellent way to visit Mexico would be to bounce around to all of the designated “Pueblos Magicos” in the country. I looked at the list yesterday and had only even heard of 3 of them. There are around 40 and most of them are little visited in comparison to the major tourist destinations in this country. You’ll have a blast up here either way! 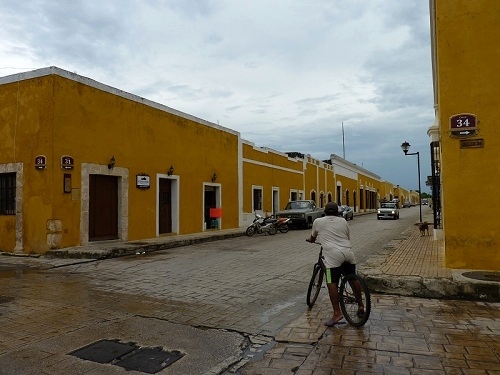 IZAMAL sounds wonderful. Would like to visit. Hey Nick – Izamal has secured it’s spot on my list of favorite locations in Mexico and I highly recommend a visit to anyone who is even remotely close to the region! Getting off the beaten path is one of the most rewarding aspects of travel in my opinion. This article reminded me of my time in Norte Argentino where I was traveling with a girl from Buenos Aires and we visited some remote areas that were nowhere to be found in the guidebook (not even on the map!). I didn’t realize that Mayan culture still existed today – that’s quite fascinating. @Nomadic Samuel – So many people I talk to also have no idea that the Mayan community is not only around but going strong these days. It’s such an experience to visit their ancient pyramids one minute and then be sitting in one of their present day communities the next. Seems like this road trip would be very much to your liking based on your Argentina story. Places not on the map almost always prove to be well worth a visit! Very enjoyable read, such interesting town & streets. The buildings definitely stand out. Wonderful narration, Earl! Reminds me of some of the more remote towns in Colombia, where the atmosphere can be similar to what you describe… say, Mompox in low season… so relaxed, just the Magdalena river flowing by slowly, and everybody sitting under trees and in the shadows of the patios in order to cope with the heat… so yes, Yucatán state sounds like a great place to visit, and I’ll keep the magic village on my mind! Hey Fabian – The appreciation of small things is often what turns an ordinary day into a memorable one. I really couldn’t believe that everything was so yellow. The look and the vibe that it produced was simply amazing to me, similar to how you must have felt riding by all of that beautiful green on your bike ride. Perhaps we need to do a switch one day. I’ll head down to explore remote Colombia and you can head up here and roam around the Yucatan. And of course afterwards we should pick a place and finally meet in person! Great plan! Seeing more of Mexico than just Quintana Roo is definitely on my list! And I can wholeheartedly recommend you to give Colombia a visit, too!